Immunohistochemistry of paraffin-embedded human stomach using HDAC6 Polyclonal Antibody at dilution of 1:100 (x40 lens). 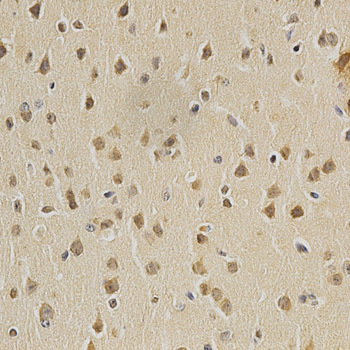 Immunohistochemistry of paraffin-embedded mouse brain using HDAC6 Polyclonal Antibody at dilution of 1:100 (x40 lens). 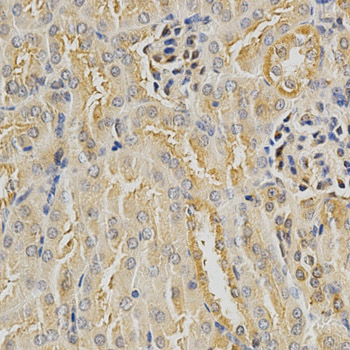 Immunohistochemistry of paraffin-embedded mouse kidney using HDAC6 Polyclonal Antibody at dilution of 1:100 (x40 lens). Histone deacetylases (HDACs) play a critical role in transcriptional repression of geneexpression in eukaryotic cells through catalyzing the hydrolytic removal of acetyl groups from histone lysine residues. Three distinct families of HDACs have beendescribed, comprising a group of at least 20 proteins in humans. HDAC6 is a class II histone deacetylase. 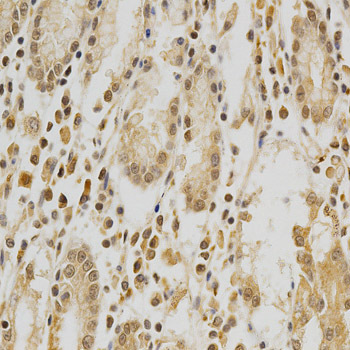 HDAC6 Polyclonal Antibody. Unconjugated. Raised in: Rabbit. Chacon-Cabrera A et. al. (October 2016). Short- and Long-Term Hindlimb Immobilization and Reloading: Profile of Epigenetic Events in Gastrocnemius. J Cell Physiol. Subramanian C et. al. (August 2011). HDAC6 deacetylates Ku70 and regulates Ku70-Bax binding in neuroblastoma. Neoplasia. 13(8):726-34.